It's also named slewing gear drive, are mainly applied in crane, excavator, engineering machinery, sun-tracking system etc. Slewing bearing drive has different types and specifications, according to the similar raceway diameter slewing drive. Specification "WD" is the acronym of worm and drive, which is often used abroad of China. 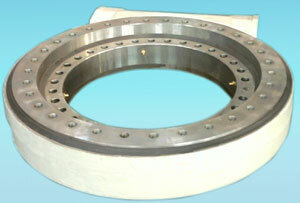 Slewing drive consist of slewing ring, worm, casting housing and some standard components. It widely used in solar energy power generation system and engineering machinery. We are professional manufacturer and supplier of slewing drive in China. We make all kinds of slewing bearings, such as double-row different ball diameter bearing , three-row roller bearing, ball and roller combined bearing. We are capable to design and manufacture non-standard slewing bearing independently. Our products are widely used in various application fields, such as port, ship, vehicle, mining, engineering, lifting, environmental protection, oil, chemicals, light industry, metallurgical machinery and the military etc. With 19 years of experience, our products are widely export to USA, Germany, Japan, Spain, Canada, Italy, France, Finland, Korea, India, Singapore, Brazil, Australia etc.